I had a mixed experience in paradise. 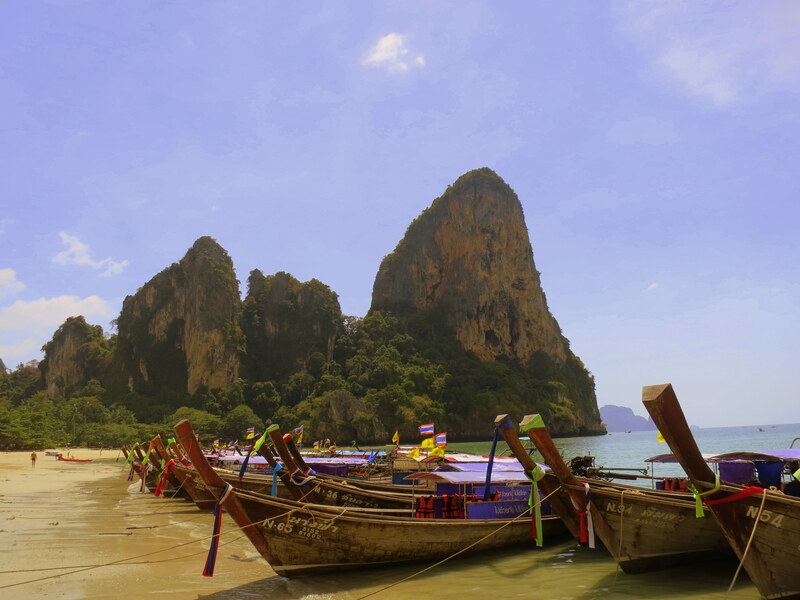 The islands of Thailand are gorgeous, no question, but they’re also woefully underprotected and poorly maintained. For as long as Thailand has been a vacation destination, you’d think there’d be more regulations in place to protect the delicate ecosystem that everyone’s excited to see. Unfortunately, that’s not the case. There are a few islands that are national parks, but those aren’t watched very carefully, and new (illegal) developments go up all the time. Tons of tours go out to the islands every day, and there aren’t enough trash cans or port-a-potties for the number of tourists that tear through there. Trash literally piles up on the beach. Pools of motor oil form in the bays as longtail boats maneuver in and out of the tight spaces. Snorkeling reveals little in many places, as the water’s cloudy with pollution. Way too many people amass on each tiny beach and spoil the view and the experience. And of course, as I was always aware, I was part of the problem, just by being there. I saw at least four Navy ships guarding the perimeter of the waters near the royal residence–we’d be shot on sight if we got too close! And yet, it’s still beautiful, worth visiting and admiring. I went on a tour to Hong Island, which included stops in the shallows of Deng Island and the bay of Paradise Island, and a detour past some ships guarding the princess’s summer residence. Probably about 40 of us piled on to a longtail boat with a driver and a guide (whose name I forget, unfortunately) and off we went into the bright sunshine. Deng Island was a tiny rock with some scrubby bush upon it, and we anchored next to it for a quick snorkeling session. But the sea was choppy and most people didn’t last long in the water. At one point, we heard a scream from a woman who, turns out, doesn’t know how to swim but had jumped in with her life jacket anyway; she found the rough waves too much to handle. Just before we got back in the boat, a huge school of yellow-white fish swirled up around us, causing everyone to exclaim that now would be a good time to snorkel. But when you’re on a tour you don’t have time to delay, so we carried on. Paradise Island turned me off initially with the piles of trash not far from shore and the tourists sweating sunscreen into the water, but once I swam a little away from the crowd, I liked it much more. I snorkeled in the space between the island and the rock form next to it, and found lots of interesting colored coral–waving red ferns, shocks of purple stalks. It was a nice little stop, although I’m sure it’s vastly different from what it was even five years ago. We had lunch at Hong Island and then split up; most people set up on the beach for some sunbathing, and about 15 of us who’d paid a bit extra got into kayaks. They were two-person kayaks, but the guide decided I was too heavy to share, so he had me sit in the middle and pilot one on my own. I could have shared no problem, but you do as your guide says. It was difficult to keep up, since I’ve never kayaked in the ocean before and I was doing the work of two people, but I’m proud to say I managed it. 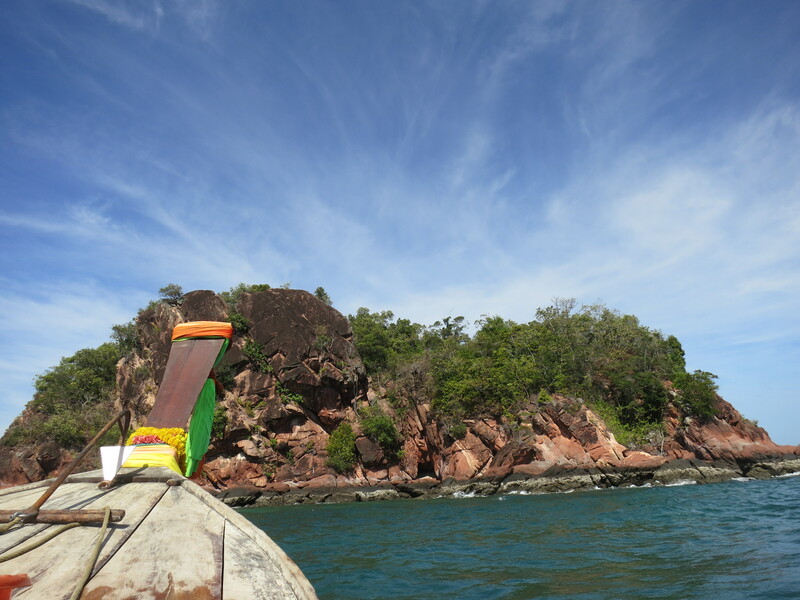 We followed the coast of the island around a couple of curves until we reached the lagoon on the other side. 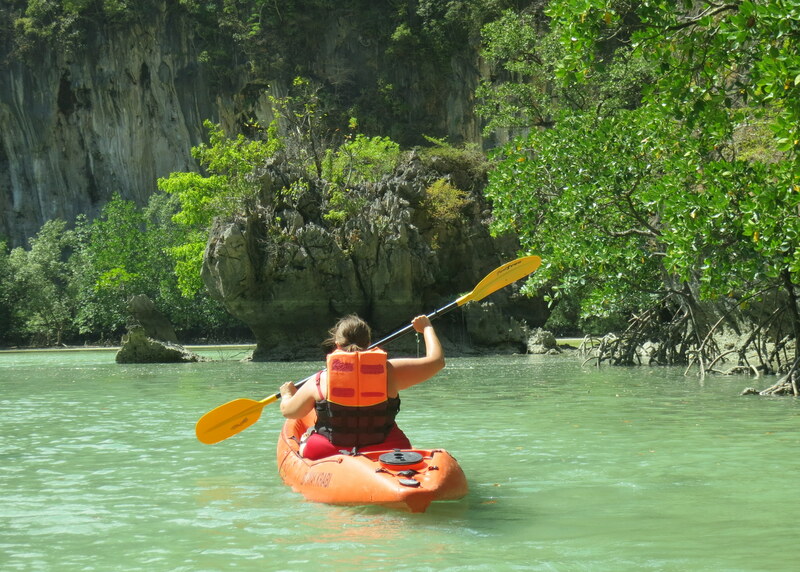 We paddled down a short, narrow passage that opened up into a large cove surrounded by limestone cliffs covered in foliage. The water was a bright, light green of the exact shade called “seafoam” on paint samples. We were in maybe 2 feet of water, and our guide reached down to the sand and pulled up large white starfish to show us. It was an idyllic spot, but almost the whole time we were there the serenity of the moment was broken by the speedboats that forced their way into the lagoon, despite being far too large for the shallow water; they’d noisily move around the lagoon, then get stuck in the sand and make even more noise revving their engines to get unstuck. 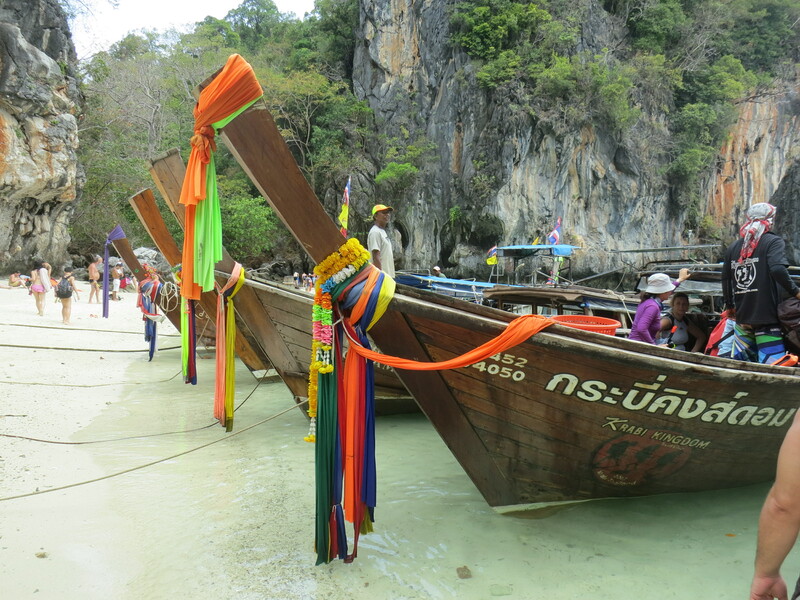 My other day trip out of Krabi Town was a visit to Railay. 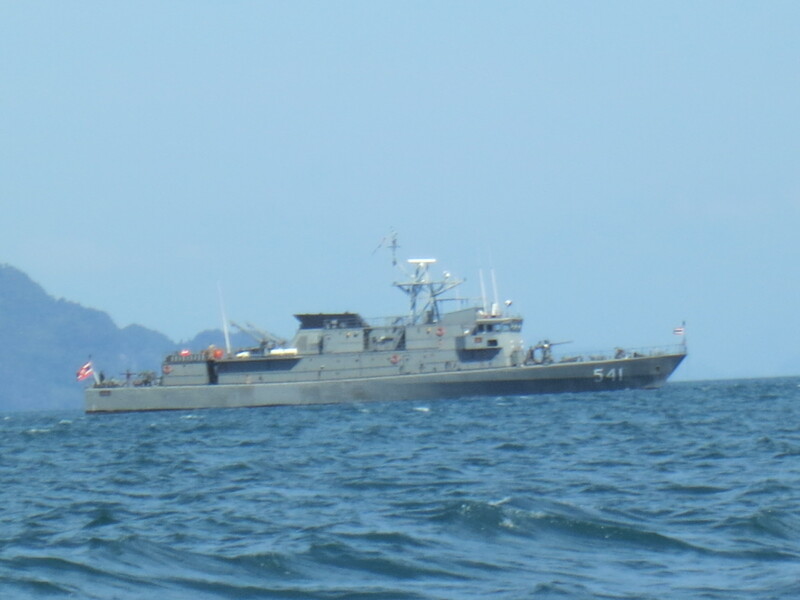 To get there, I took a songthaew to Ao Nang Beach (a small, uninspiring beach backed by an unrelenting strip of shops–I wouldn’t recommend it if you’re looking for a place to base yourself in the area), then a longtail around the coast to West Railay Beach. I think my expectations were a little high, because I was disappointed. 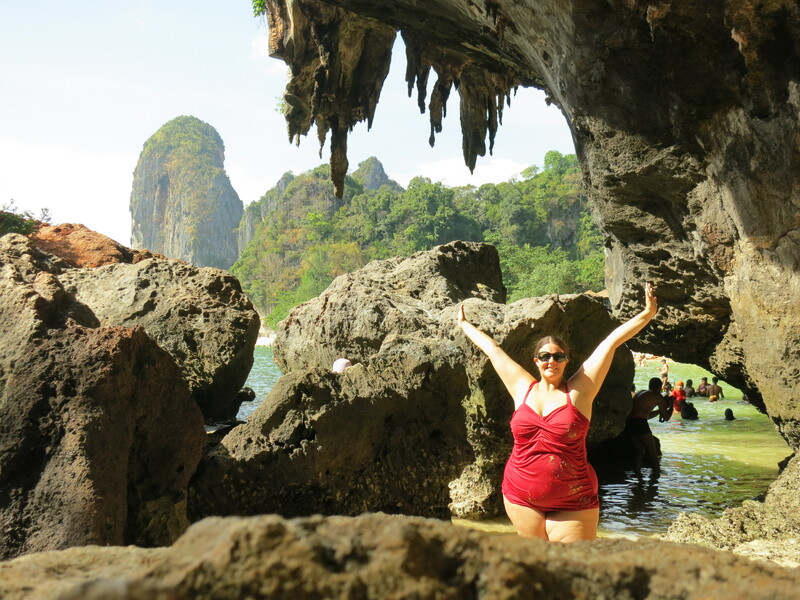 Everything at Railay was overpriced (water was four times what it was anywhere else I’d been in Thailand), and there seemed to be few places to set yourself up on the beach since so much space was taken up by longtails. Also, it was super crowded. 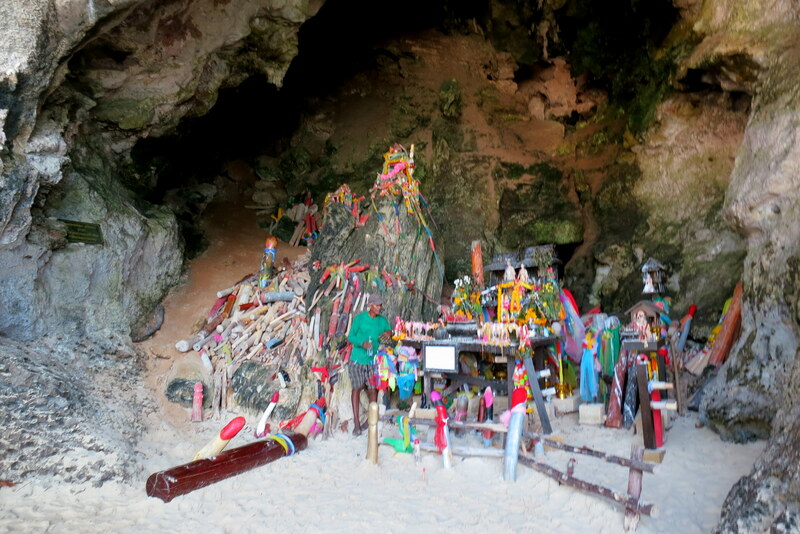 I walked around to Pra Nang, which was a small beach boasting a cave full of lingams and a pile of rocks to scramble on, and I was overwhelmed by the number of people packed into that tiny space. 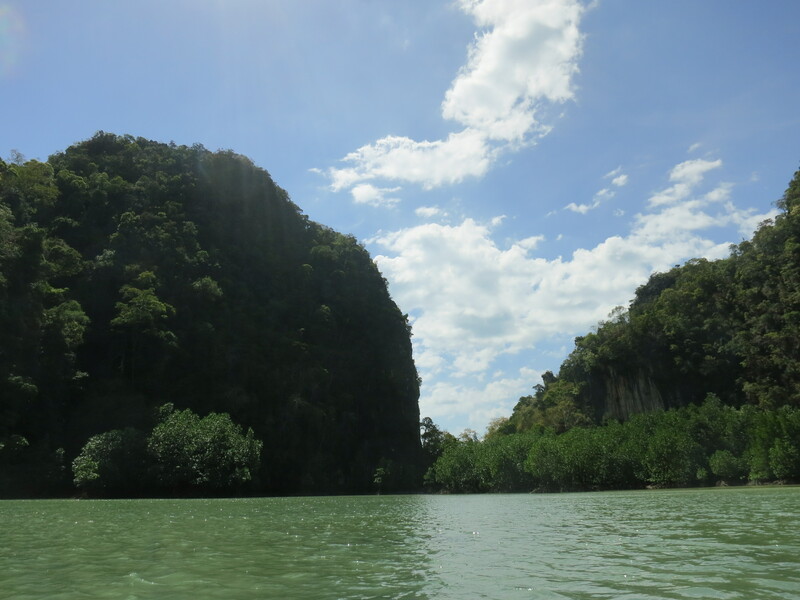 I’ve talked to people who stayed at Railay, and they had a much better time; they were able to find hidden areas to sunbathe and swim, so they could focus on the undeniable beauty of the limestone cliffs and calm blue-green water without getting distracted by crowds and a need to catch a boat back before prices went up at sunset. 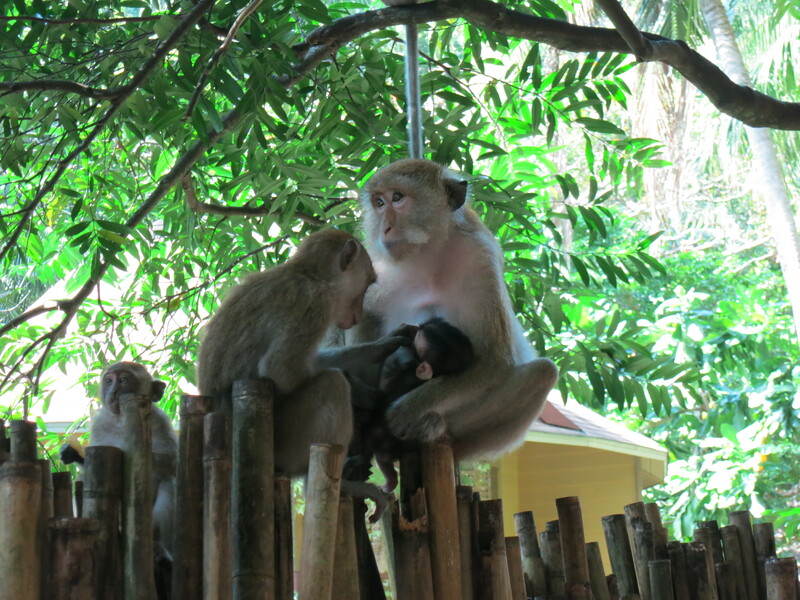 I did get to see some monkeys on my walk to and from Pra Nang, including a baby! 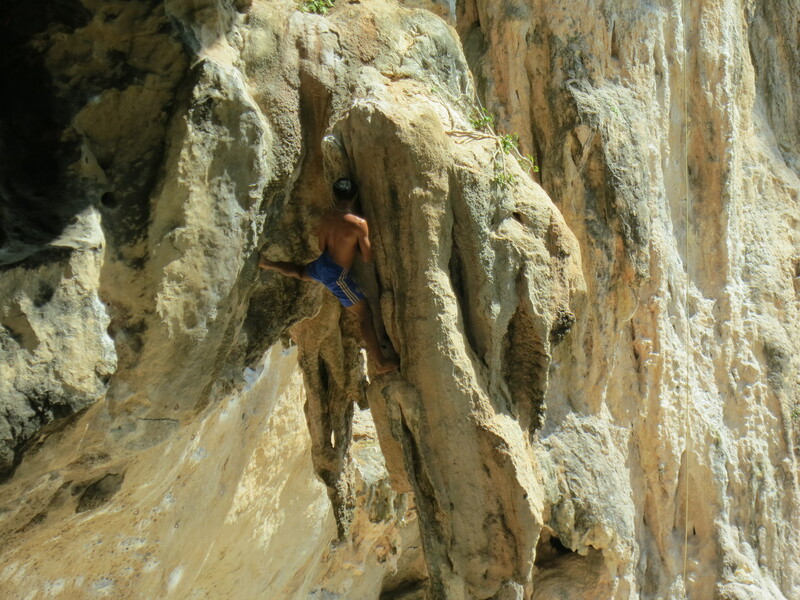 I also stopped by Tonsai, a popular climbing spot, and watched several people clip in and maneuver up and down those sheer cliffs. It looked terrifying, but they had smiles on their faces, so well done them. I’m not sure what the solution is for the conservation-minded tourist who wants to visit the Thai islands. There are some tour groups out there making an effort to be eco-conscious, so you can give your dollars to them. You can also go to more out-of-the-way islands, although those are becoming harder and harder to find, so you’re not adding to the overcrowding of the popular ones–but does that mean you’re just speeding up the exploitation of an otherwise untouched place? You could just not go at all, but missing out on the beauty of this part of the world would be a shame. I took a visitor survey at the airport and made a big deal about the lack of conservation efforts, so maybe if enough tourists do that it’ll catch a government official’s eye. I don’t know–what are your thoughts? 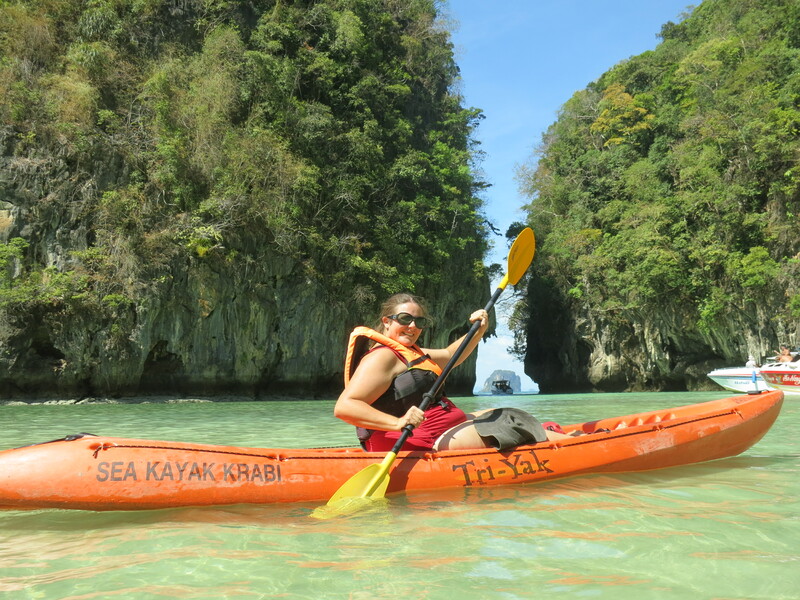 This entry was posted in Thailand and tagged Andaman Sea, conservation, Deng Island, ecosystems, ecotourism, guided tours, Hong Island, lingam, Paradise Island, Pra Nang, Railay, rock climbing, snorkeling, Thailand, tours, West Railay Beach by lisafindley. Bookmark the permalink. Wow, Lisa, that’s a really hard question. Part of the problem is that if the beauty is all walled off and untouchable, then people aren’t usually motivated to preserve it. I guess ecotours would probably be the least conscience-rubbing option. But at any rate, you got to see a baby monkey, and for that alone I think this part of your trip was worth it! Those are all true statements, Meredith! Thanks for posting this. It’s an important and much discussed dilemma: Some great writers have written on the topic and I highly recommend checking them out if you are interested. Aldo Leopold in Sand County Almanac writes that it is a personal relationship with the land (built on our positive, interactions with nature) that creates the love, respect, and admiration that are the bedrock for responsible stewardship. However, to the human footprint left by tourism, recreation, and interaction with the land degrade it! In relation to Thailand specifically, David Fahn wrote a book called Land on Fire which is an excellent discussion of the environmental problems facing the rapidly developing nation. In particular he writes on the fate of the tropical tourist islands through a process he aptly names “tourist rot.” First the relatively healthy and undisturbed islands are discovered by the backpackers, then by the guide-books, which leads to the rapid development of resorts, piers, restaurants, massage parlors, etc. All without regulation or limitations, of course. Eventually the area is ‘used up’ and tourists move on to a new ‘pristine’ destination. I think blurbgirl’s comments on ecotourism are right on: it faces a multitude of problems of its own, in particular ‘green-washing,’ but I think it’s a step in the right direction. Martha Honey’s Who Owns Paradise? is a great case-study based resource on the topic. I did my undergraduate thesis on coral reef decline and island development in Thailand – so it’s a topic close to my heart! Hope some of these resources are helpful to you! p.s. some Thai Island specific eco-conciousness actions are 1) consider resorts for if they are locally owned, have actual septic systems (most don’t), or have other eco-features 2) avoid eating the fish (or at least reef species) 3) practice good diving etiquette – don’t step on or touch the coral and 4) find a suitable place to dispose of trash, possibly even taking it back to the mainland with you (trash is often burned to get rid of it, since shipping off island is expensive) 5) pressure governments to make environmentally responsible regulatory decisions 6) educate yourself and spread awareness. Thanks so much for commenting, Genevieve! That sounds like an excellent SIP topic. I did meet some tour guides in Thailand who encouraged us not to eat fish at the local restaurants, which seems to go with your second Thai-specific recommendation, but far too few guides made a big deal about not stepping on the coral. I saw at least three people stand on the coral to adjust their face masks while snorkeling, and they were miffed when I mentioned that was a bad idea. But I figured, you gotta at least say something. Hey Lisa! This was definitely on my mind while visiting the islands, too. I feel like there should be some sort of visitor’s tax that could work on clean-up/conservation efforts. It seems like a short-sighted solution, but maybe it could solve some of the low-hanging fruit problems like excessive trash and could mark off sections of the beach that are allowed to recover every year (kind of like the bird sanctuaries on the Chicago lakefront or fallow fields in agriculture). Surely these wouldn’t be enough on their own, but maybe they’d be a start? Just brainstorming. It’s SO great to see you keeping your critical eye but having fun at the same time. Keep it up! Yeah, I think those are good ideas. Make the tourists who invade the area pay a little more for the upkeep, and create the incentive for the locals to help make it happen.